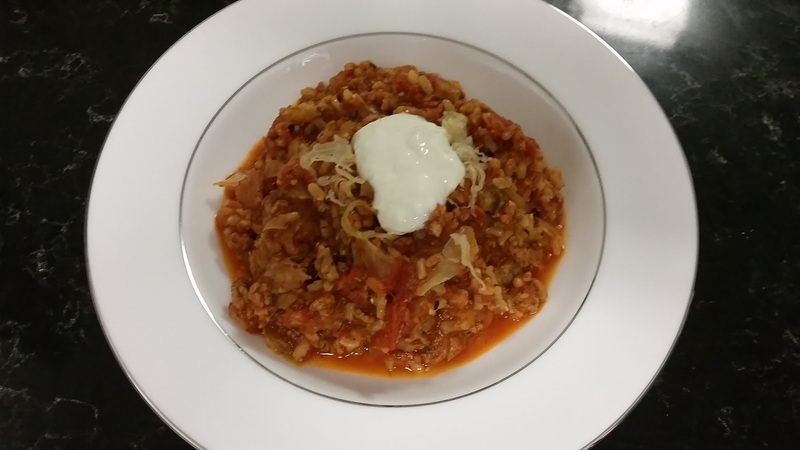 Years ago I made the most delicious cabbage roll meal (Sarmale) from back when I used cookbooks. It literally which blew my socks off. 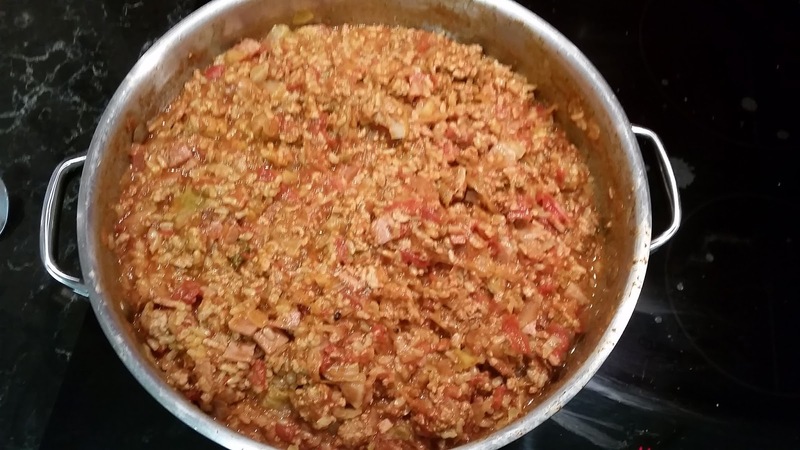 Sarmale made by wrapping a pork, rice, herb and spice mixture in par boiled cabbage leaves, then baking them in the oven with a tomato based sauce on top. So healthy! The flavour was gorgeous but it took so so long to make, and didn’t work so well with reheating. I have wanted to make it again on numerous occasions but it has been too much work for one night only given how poorly it reheated. A few weeks ago, however, I stumbled across a reference to “unstuffed cabbage rolls” and my world opened back up again – why must these flavours be served in such a finicky way? Why not just throw in all of the distinctive flavours in one pot? So I tried my own version and I can tell you that I am a convert now. I will never bother stuffing real cabbage rolls again. Top this meal with a dollop of natural yoghurt with lemon rind and you have a winner! Brown the onion and bacon in a small amount of oil in a large frying pan until the onion is translucent and the bacon is browned. Add garlic, tomato paste and spices, stir until fragrant. Add water, tinned tomatoes, cabbage, lemon juice, rice, salt, pepper, dill and saurkraut. Bring to the boil, then simmer, covered for 30mins. While this is happening, Zest one lemon rind into your natural yoghurt and stir. Remove the lid and simmer for an additional 15-20 minutes, or until the rice is cooked and the meal has thickened. you need glasses) – sorry for the terrible pic! Serve topped with additional sauerkraut (if desired) and yoghurt. Yum yum yum yum yum. The flavour profile of this dish is so different to what we normally eat and I could have it every second week. It made enough for two of us to eat over 4 nights, so that is a big bonus, plus it is pretty healthy. Added bonus: only one pot to wash! It has been about a month since I actually made this, so perhaps we are due again next week…. ADIT: I made this again this week – NOM! And I have to say upon second cooking that the sauerkraut cannot be optional. It makes the dish. I also reduced the amount of water because mine took too long to cook down tonight. I’ve updated the ingredients accordingly. Still delicious though! So glad to have posted just in time! Let me know how it goes 🙂 The finicky version is waaaaay too much work and tastes about the same. May I recommend a glass of Geisen sauvignon blanc with this meal? It is the perfect match.